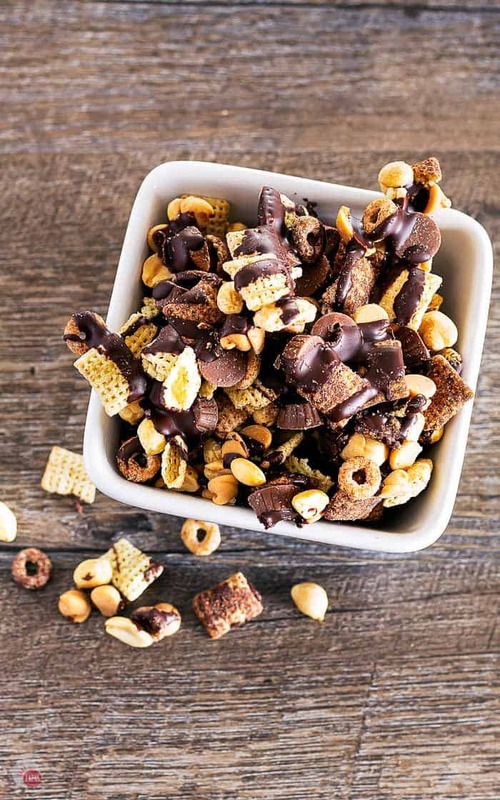 If you love chocolate and peanut butter you won’t be able to resist this Buckeye Snack Mix. Crunchy, creamy, salty, sweet, and so much chocolate and peanut butter! If you have never had a buckeye, you are totally missing out. Especially if you love the combination of chocolate and peanut butter! A Buckeye may be a person that lives in or is from Ohio, but it is also a delicious treat made from peanut butter fudge and dipped in chocolate. It gets it’s name because it looks like the nut of a buckeye tree. The second definition is the one that I am focusing on today. Because, let’s face it, chocolate and peanut butter is more fun to talk about than Ohio. So how do we turn a candy into a snack mix? Read on my friends!! Just take me to the Buckeye Snack Mix Recipe Already! If you’d rather skip my (very helpful, I think) tips and tricks, essential cooking info, and similar recipe ideas – and get straight to this delicious easy Chocolate Peanut Butter Chex Mix Recipe – simply scroll to the bottom of the page where you can find the printable recipe card. How do you make Buckeye Candy? Typically you would start by making the peanut butter fudge center by combining peanut butter, powdered sugar, and butter. This batter is scooped, rolled into balls, chilled in the fridge, and then dipped in chocolate. That sounds like a long process doesn’t it?!? Instead of all that craziness, what if I showed you how to make a chocolate peanut butter snack mix that tastes like traditional buckeyes but easier, quicker, and with a little crunch too? I am so let’s get started! 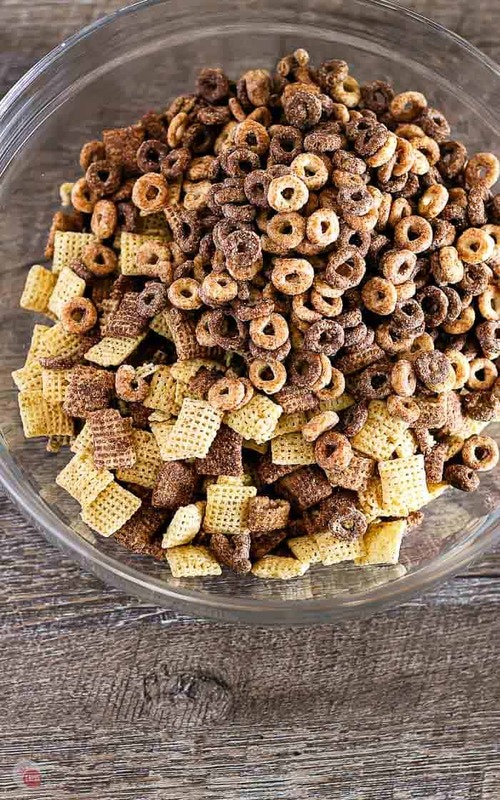 You can’t start a great snack mix without some Chex cereal. Luckily they have a chocolate version so that’s a great place to start. The more chocolate the better so let’s add some more with Cherrios. I found a chocolate version or Cheerios but while I was at the store, I also spotted a chocolate AND peanut butter version too. Even better! With the Chex and Cheerios in a bowl, I add some peanut butter chips to even out the chocolate to peanut butter ratio. For more crunch, a handful of dry roasted peanuts is perfect and makes it feel like a healthy trail mix despite the name! And it wouldn’t be complete without throwing in some mini peanut butter cups for good measure! 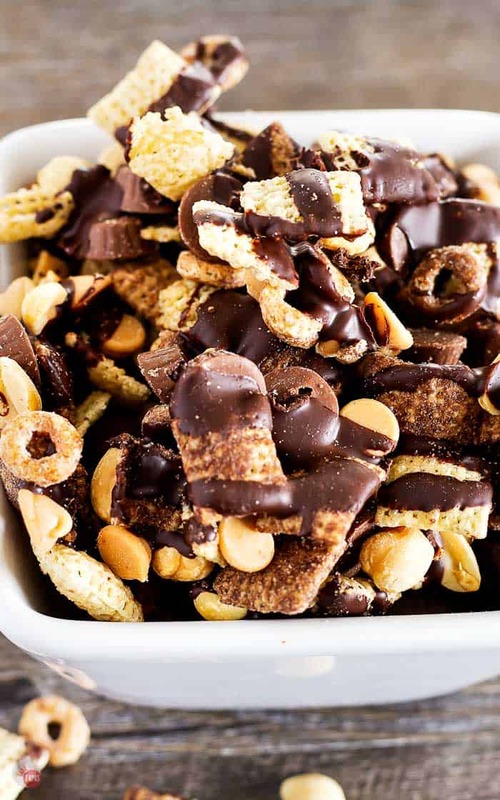 To finish the Buckeye Snack Mix, a drizzle of chocolate does the trick. The melted chocolate binds the individual ingredients together so you get different tastes and textures all in one bite. It’s no fun if all the peanuts or mini peanut butter cups fall to the bottom of the snack mix! This Buckeye Snack Mix can’t be described as gluten free because the chocolate peanut butter Cheerios are not certified GF. If you need a GF version, you can use the plain chocolate flavor of Cherrios. Those are certified. 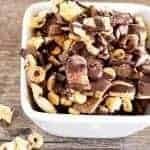 All the other ingredients I use in this recipe are considered gluten free but of course the snack mix is not peanut free so if you have a peanut allergy, this Buckeye snack mix is not for you. 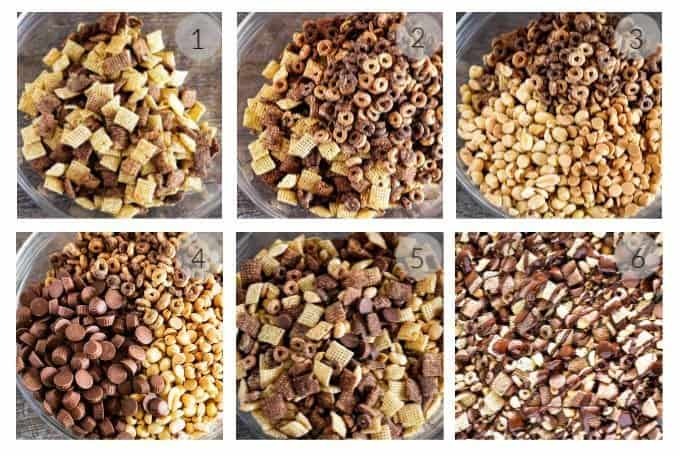 Other great Chocolate & Peanut Butter Chex & Snack Mix recipes to try! A: the Chex cereal part is but the Cherrios are not certified gluten free as they are processed in a facility that isn’t gluten free. Q: How far in advance can I make this? A: Buckeye Snack Mix can be made up to 2 weeks in advance, just be sure to store in an air-tight container. Q: If I can’t find the mini peanut butter cups what can I use instead? A: If you can’t find them, I would suggest plain chocolate chips, or small chocolate candy bar pieces. If you love this Easy Buckeye Chex Mix Recipe as much as I do, please write a five-star review, and be sure to help me share on Facebook and Pinterest! In a large mixing bowl, combine the Chex cereal, Cheerios cereal, peanut butter chips, dry roasted peanuts, and mini peanut butter cups. Spread out on a baking sheet into a single layer. 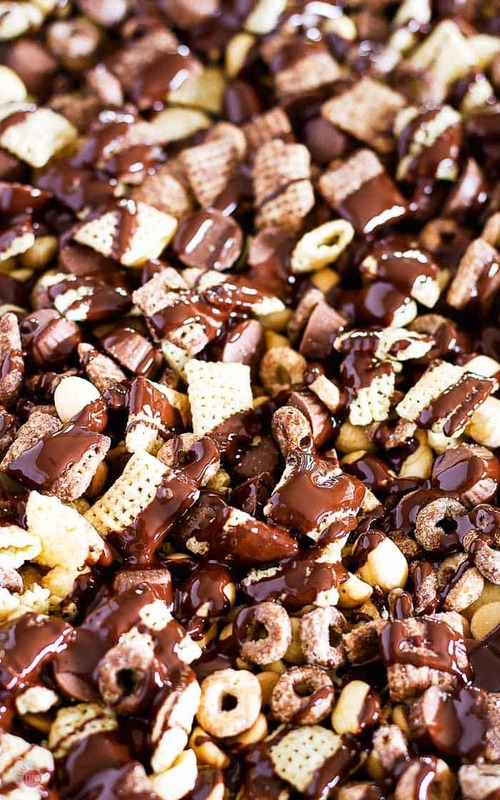 Drizzle the chocolate over the Buckeye Chex mix getting chocolate on as many pieces as possible. Chill for 15 minutes to set chocolate. Break into pieces and store in an air-tight container for up to 2 weeks. * If you like this recipe, please leave me a comment and rate it with some stars. Thank you! Peanut butter and chocolate is the best combination of flavors! I made a batch for my son and his roommate. Now they think I’m pretty cool – ha! I’ll tale that! We just LOVED this recipe!! It disappeared in a flash!! Chocolate and Peanut butter lovers HAVE to try this! Oh good grief… this is so tasty Ive had to go back to the store to buy the ingredients a THIRD time ….. My family keeps eating it all in a matter of hours! Needless to say we’ll be keeping this for a fun snack mix for family game night again! I’m a snacker and you’ve definitely got me covered with this delicious recipe! This bowl of deliciousness won’t last long at our house I have all of the ingredients and I making it tomorrow!! We can’t wait! So easy and sure to be a hit!!! Chocolate and peanut butter is such an awesome combo. My family really enjoyed this! I made it for Friday night movies on the couch, and there’s none left. This snack mix looks so addicting! I need to make a batch of it this weekend!